Do you have a garage where tools and other items are stacked in boxes on the floor of your garage? Do you have hopes of someday using your garage for something other than a warehouse? If so, its time you organize your garage a little and the first place to start is with the addition of a garage workbench. When it comes to garage workbenches you can either buy some low quality pre-fabricated one from a home improvement store or you can build your own rugged one. Building your own garage workbench is not as difficult as you may think. It is also reasonably inexpensive to build, and requires a limited set of tools and time. The garage workbench plans and instructions detailed in this Ebook are for a 4’ x 2’ workbench. The “Build a Garage Workbench Ebook” from HomeAdditionPlus.com (immediate download) provides detailed, yet easy to understand, mechanical drawings and instructions for building a garage workbench. Pictures are included in every step of the build process. Order Now and Immediately Download the Build a Garage Workbench EBook today! 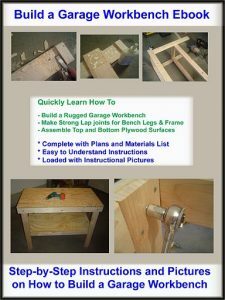 The Build a Garage Workbench EBook costs only $11 and is 100% guaranteed. Save yourself Time and Money! !